Munim Al-Rawi, Ph.D., Carta Design Ltd. The giant Kirkuk field, discovered in 1927, has had a very chequered history and requires imaginative reservoir engineering methods to return it to optimum productivity. The Kirkuk oilfield is partly located in the Kirkuk Governorate in north-eastern Iraq and partly in the Erbil Governorate in Kurdistan Iraq. It was discovered by the Turkish Petroleum Company at Baba Gurgur in 1927 and was brought into production by the Iraq Petroleum Company (IPC) in 1934, which produced it until full nationalisation in 1972. From then it was operated by the Iraqi National Oil Company (INOC) until 1989 when the North Oil Company (NOC), a state-owned company, replaced INOC in the operation of the Kirkuk oilfield (see GEO ExPro Vol. 6 no. 2, Oil from Babylon to Iraq, for a fuller history of the discovery of the field). 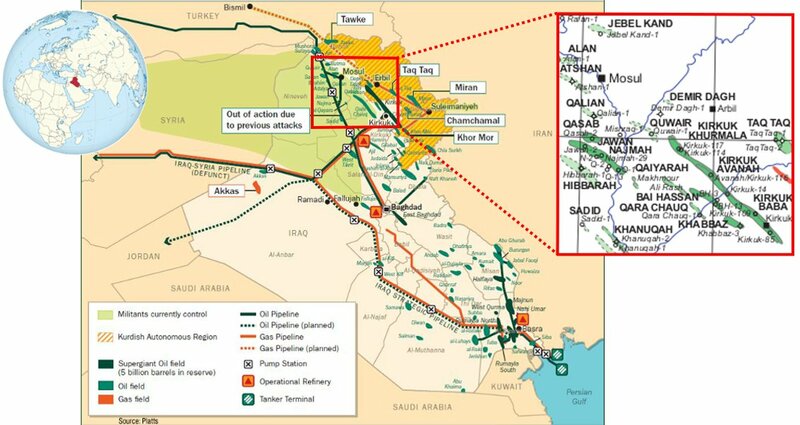 On 11 July 2014 Kurdistan Regional Government (KRG) forces seized control of the field, and it is reportedly pumping 120 Mbopd from Kirkuk and the nearby Bai Hassan field via the KRG export pipeline, which runs to the Turkish port of Ceyhan on the Sea. This giant field, managed by different operators and at the centre of a very troubled and much fought over region, has silently suffered a great deal of reservoir damage. Kirkuk includes three pay zones. The first, the Kirkuk Tertiary Reservoir, is the largest producing reservoir in Kirkuk and comprises 98% of Kirkuk’s recoverable reserves. 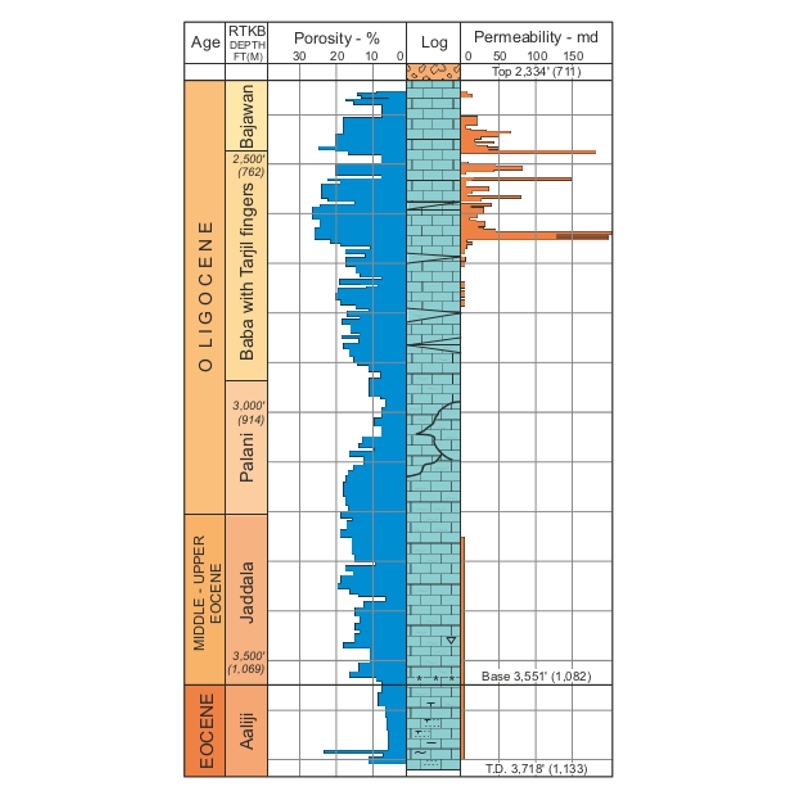 The second and third pays in the Upper and Middle Cretaceous are small and non-producing. The original oil in place reserves of Kirkuk were estimated at 38 Bbo. Since 1934, the field has remained the most important producer in northern Iraq, with over 8.9 Bbo proven remaining oil reserves in 2007. After eight decades in operation, and many reservoir problems, Kirkuk still produces 0.5 MMbopd. In the subsurface, Kirkuk is an anticlinal structure trending northwest to south-east, 100 km long and 4 km wide at the original oil/water contact level in the Tertiary Reservoir. Structurally, it is composed of three domes, referred to, from south-east to north-west, as Baba, Avanah and Khurmala, which are separated by saddles, namely Amshe and Dibega. At the surface, however, it is a simple folded structure due to the Miocene salt flowage of the Lower Fars Formation. Schematic cross-section of Kirkuk Baba Dome; not to scale. Modified after Dunnington, 1958, Figure 17. 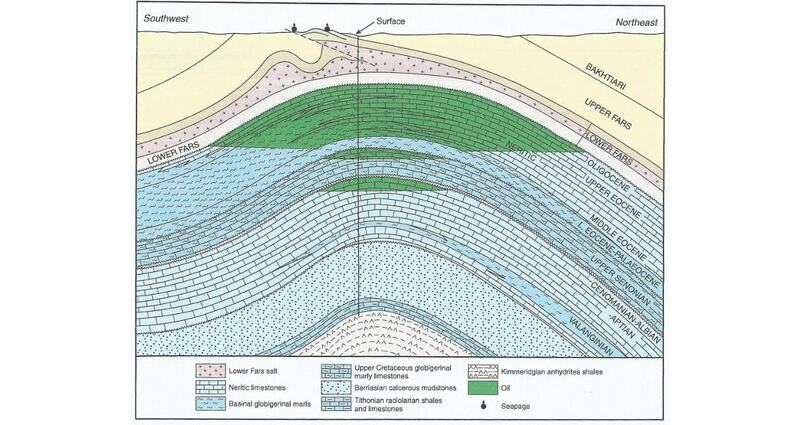 Schematic longitudinal cross-section of Kirkuk field. Modified after Dunnington, 1958, Figure 18. The Eocene-Oligocene Kirkuk Tertiary Reservoir is 365m (1,200 ft) thick and consists of a series of extensively fractured limestones, some porcelaneous and some dolomitised. These limestones were deposited in a variety of environments, including back-reef/lagoonal, fore-reef, and basinal, and have a wide range of porosity and permeability properties. The Oligocene Bajawan, Baba, Tarjil, and Palani Formations, which belong to the Kirkuk Group, are producing in Baba Dome, while the Eocene below, namely the Avanah and Jaddala Formations, are producing in the Avanah and Khurmala Domes. The oil is contained both in an extensive, extremely permeable but low-capacity fracture system and in a low-permeability but high-capacity, matrix-pore system. The porosity and permeability of the carbonates of the Kirkuk Group are usually good; some wells within the Baba Dome produced 100,000 bopd. The porosity ranges from 15 to 25% (averaging about 22%) and the average permeability is about 100 mD. The API gravity of oil ranges from 18° to 36° (average 30°) and was approximately 500 psi undersaturated at the original reservoir pressure of 1,100 psi. Sulphur content is 1.5–4%. The reservoir is underlain by a field-wide aquifer. The other two reservoirs in the Kirkuk oilfield are the Upper Cretaceous Shiranish Formation and the Middle Cretaceous Upper Qamchuqa Formation. They are fractured carbonates, contain oil and gas, and are likely in communication with the first pay reservoirs. However, these reservoirs have been kept for pressure observation and were not commercially produced. As of January 1989, the original oil in place reserves of the Kirkuk oilfield were estimated at 38,045 MMbo, proven remaining oil reserves were 10,238 MMbo, and the cumulative oil production to end 1988 was 12,017 MMbo. Proven remaining oil reserves were reported as of January 2007 to be 8,973 MMbo, including estimated reserves for Khurmala Dome of 2,800 MMbo in place with 1,000 MMbo recoverable. Production at Kirkuk started in 1934 from the Kirkuk Tertiary Reservoir in the Baba and Avanah Domes only, continuing at a low rate for the first twenty years of production. From 1951, however, there was a rapid five-fold increase in production over just three years. The reservoir is characterised by a density of fractures in the entire structure, but particularly in the structurally higher zones. This quick increase in production resulted in a rapid decline in reservoir pressure, and caused the creation of secondary gas caps in both Baba and Avanah Domes, since the water drive force is weak, as well as a small rise in the oil/water contact. Estimated reserves and production for the Kirkuk field. To maintain reservoir pressure, it was decided to use water injection, with, as a temporary measure until the start of water injection, gas from the nearby Bai Hassan being injected into Kirkuk from 1957 to 1961; 200 Bcfg was injected in total. Water injection started in 1961 at Amshe Saddle. Despite the wide distribution of injected water in the Baba and Avanah Domes, it did not reach the south-east part of Baba Dome or the north-west part of Avanah Dome in equal amounts, which caused a rise of the oil/water contact in the producing regions of Baba and Avanah Domes, which in turn had a domal effect on the contact. In 1970 water injection commenced in the Tarjil area (south-east of Baba Dome), followed in 1978 by water injection in north-west Avanah Dome. It is important to note that production of oil from the Kirkuk Tertiary Reservoir is done by the removal of oil from fractures, vugs and large pores through water swapping in a rapid or instantaneous manner, and also by imbibition, where water replaces oil in small pores, in a slow process that requires time. Assessment of the imbibition process and the rate of oil recovery and remaining oil in the flooded areas of the reservoir are the subject of ongoing reservoir engineering and laboratory studies. A continuous increase in production rates requires the drilling of wells to replace those flooded by water because of the rising oil/water contact. The total numbers of wells drilled rose from 162 in 1964 to 230 by 1989. An analysis of this outstanding Kirkuk Tertiary Reservoir reveals a number of factors affecting reservoir behaviour. Kirkuk Tertiary Reservoir characteristics, Well K-115. Modified after INOC, 1987. Calculating the actual percentage of fractures and vugs within the reservoir, which affects the oil reserves volume and recovery factor calculations of the original oil in place in rock matrix and fractures. Current estimates are that 95% of oil is in the matrix and 5% is in fractures. Reservoir water salinity is low, dropping to 90,000 ppm. Measurements taken before the start of water injection indicate that it has changed in the three domes, which makes it difficult to calculate the original water saturation. Water injection has altered the salinity in the fracture areas. Mud loss during well drilling in the highly fractured areas of the reservoir makes it difficult to measure reservoir resistivity and water saturation. Due to the variation in the reservoir rock characteristics and fractures, it is also difficult to precisely simulate reservoir behaviour. There are difficulties in evaluating the level of water saturation in flooded areas, and in estimating how much oil remains in the reservoir. Declining crude oil qualities and increased ‘water cut’ (damaging intrusions of water into oil reservoirs) were probably the result of over pumping. Production from Kirkuk reached as high as 680,000 bpd, well above the field’s estimated optimal production rate of 250,000 bpd. Iraq attempted to sell as much oil as possible in the months leading up to the March/April 2003 war. 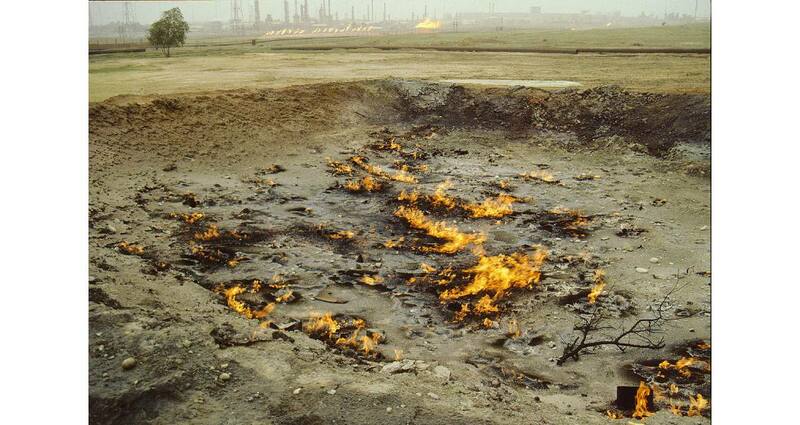 In addition, some analysts believe that poor reservoir management practices during the first Gulf war between 1981 and 1988, including the reinjection into the periphery of the Baba Dome of excess fuel oil (as much as 1.5 Bbo by one estimate), refinery residue and gas-stripped oil, may have seriously, even permanently, damaged the Kirkuk Tertiary producing reservoir. Among other problems, fuel oil reinjection has increased oil viscosity at Kirkuk, making it more difficult and expensive to get the oil out of the ground. The unique Kirkuk Tertiary Reservoir has suffered a great deal from different management practices and will require imaginative reservoir engineering methods to put it back into good productive order. Some reappraisal has already been undertaken and will require full implementation on the ground to achieve results. In September 2013, BP signed a letter of intent to help revive this ageing oilfield through a better understanding of the state of the Kirkuk reservoir. For BP, the agreement could be a first step toward clinching a longer-term development contract. Will the current political status in Iraq allow Kirkuk to be productive again? Adnan A. M. Aqrawi, Jeremy Goff, Andrew D. Horbury and Fadhil N. Sadooni (2010), Petroleum Geology of Iraq, 424p, hard covers. ISBN 978 0 901360 36 8. Scientific Press Ltd, PO Box 21, Beaconsfield, Bucks, HP9 1NS, UK. Dunnington, H.V., 1958. Generation, migration, accumulation, and dissipation of oil in northern Iraq. In: Weeks, L.G. 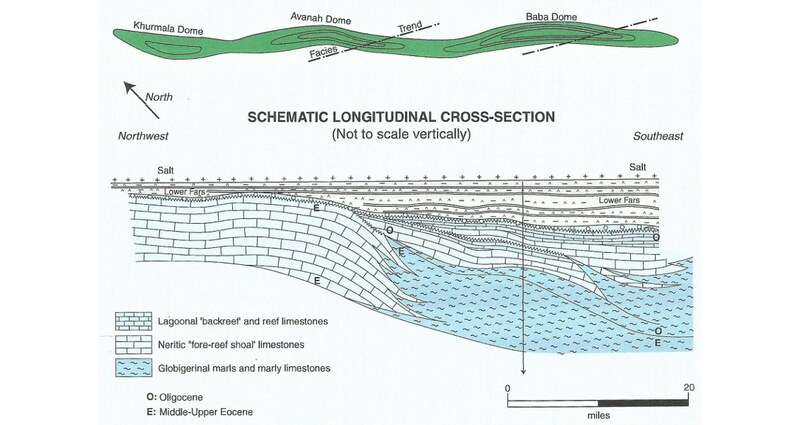 (ed), Habitat of Oil, American Association of Petroleum Geologists, 1194-1251. Reprinted in GeoArabia, Vol. 10, No. 2, 2005, p. 39-84.. Gulf Petrolink, Bahrain. INOC, 1987. Country Paper, Republic of Iraq, in Arabic, in OAPEC, 1987. Addendum of papers and case studies presented at the seminar on petroleum reservoirs. Kuwait, 11-14 October 1987. Geological Expression utilises sophisticated technology to deliver dramatic gains in productivity through a workflow whose structure will be familiar to seismic interpreters. The coast of North East England has a series of outcrops which give a detailed insight into some of the most important reservoirs of the Southern North Sea.